Tokyo, Japan -- In Japan several years ago I took a ferry across the Inland Sea and began to walk a pilgrimage route of 88 Buddhist temples that circle the southern island of Shikoku. << Womb World, one of a pair of 13th-century Japanese hanging scrolls, Mandalas of Both Worlds. The pilgrimage is devoted to a scholar-monk and artist named Kukai, who was born on the island in A.D. 774. He is considered by many to be a saint and is often referred to as Kobo Daishi, “great teacher of the Buddhist law.” You’ll see his name a lot if you visit “Japanese Mandalas: Emanations and Avatars,” which is, without saying as much, a homage to Kukai and a mini-pilgrimage in itself at the Metropolitan Museum. Kukai was a go-getter. Hungry for fresh information about the religion he had committed himself to, he sailed to China at 30 and planned to stay for 20 years, figuring that’s how long it would take to learn what he needed to learn. But things happened fast. In no time he met a master-teacher and absorbed from him the knotty form of religious thinking known as Esoteric Buddhism and, specifically, the sect called Shingon. By 806 he was back in Japan, preaching to emperors and peasants. Ten years later he established a temple retreat, a kind of Shingon Central, on Mount Koya, or Koyasan, a holy mountain on Honshu, the big island. The teachings he imported from China promised something revolutionary: that it was no longer necessary for a Buddhist believer to go through many lives to achieve salvation; it was possible to get there in one lifetime if you knew the way. That was the catch. Knowing the way was hard. It required instruction and meditation, not to mention familiarity with special rituals. To help out with this, Kukai also took back lots of visual aids. 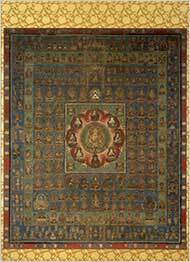 These included portraits of spiritual heroes, ritual tools and paintings of diagrammatic cosmic maps called mandalas. Some looked like astrological charts, with stars and planets floating in outer space. Others seemed to be modeled on walled cities or palaces, with various deities in residence and a high-ranking Buddha right in the middle. And paintings weren’t the only forms that mandalas took. Sacred sculptures arranged in certain ways could fill the bill, as could architectural designs. Kukai planned the general layout of Koyasan’s complex of temples and monasteries to form two paired and complementary mandalas, called the Womb World and Diamond World, one inside the other. Shikoku, with its circle of temples, could easily be considered a topographic mandala, one that a visitor would have ample opportunity to contemplate during the arduous 1,000-mile walk around the island’s perimeter. The point is that once you start thinking this way, mandalas are just about everywhere. And you are encouraged to do such thinking by the Met show. Anyone familiar with the museum’s Japanese galleries will remember that the first is permanently installed to resemble a temple, and the exhibition has been integrated into this setup. A big wood carving of the Buddha called Dainichi Nyorai sits at the center. Backed by a flame-shaped halo, he holds his hands at chest level, right fist wrapped around a raised left index finger. The gesture looks rude, but its meaning is fine: the union of earthly and spiritual realities. Everything else radiates from there. A scattering of ritual items sets the scene for worship: an incense burner, a bronze bell, an altar table, some fancy priest’s robes, even a few clay roof tiles stamped with Sanskrit characters. And these serve to focus attention on the painted and sculptured mandalas, notably two separate sets of the Womb World and Diamond World pair that Kukai introduced to Japan and which bring us deep inside the Esoteric Buddhist universe. The two paintings in one famous pair, dating to the 13th or 14th century and on loan from the Brooklyn Museum, focus on the figure of Dainichi Nyorai, but in different ways and for different reasons. The Womb World composition is a box-within-boxes affair, with a largish figure of the Buddha glowing like a gold queen bee at the center of a crimson flower, surrounded by a swarm of some 400 floating deities. This particular image, identified with divine compassion, holds out the possibility of enlightenment — Buddhahood — being achieved in our own world and time, which, of course, would be fabulous. The Diamond World mandala has a more abstract look, partly because it is more densely populated, with some 1,400 divinities sorted out symmetrically like carefully planted seeds. Here too the nested-box shape prevails, but now there are nine boxes set side by side, in a pattern that has sources in seventh-century Indian sculpture. The result is a kind of MapQuest vision of heaven as a grid. If the first painting speaks of salvation, this one takes you there. Almost as beautiful, but produced some five centuries later, is a glorious pair of hanging scrolls by the painter Matsubara Shogetsu, who was active around 1800. Here both the Womb World and the Diamond World are spun out in filigree lines of gold paint on indigo paper. The effect is like brilliant light shining through slits in a dark curtain or formations of stars in a night sky. Kukai is thought to have personally painted such mandalas. He was certainly a huge believer in the persuasive value of art. And his direct influence is all over the Met show. He was the one who took the prototypes of many of the images from China, including those of the Buddhist guardians known as the Great Light Kings. A picture of one, Daiitoku Myo-o, is on view. Called in Sanskrit “one who stops the power of the King of Hell,” he must have initially startled the Japanese with his outré appearance: extra heads, flying weapons, lotus-shaped flip-flops. But once they learned what a doll he is, everyone adored him. The show’s organizer, Sinead Kehoe, assistant curator in the department of Asian art, has slipped a portrait of Kukai himself into the show; it is in a late-13th- or early-14th-century handscroll illustrating his life as “the Great Master from Koya.” And from Mount Koya itself comes a 15th-century picture of four Shinto gods, or kami, who, being alter egos of Buddhist deities, are especially protective of the mountain. Before traveling to Shikoku, I spent some time at Koyasan, a vast compound of temples, monasteries, cemeteries, shops and tourist shelters, and probably a very different sort of mandala from the one Kukai envisioned. He died on the mountain in 835, or rather, as his devotees believe, he entered into a state of profound meditation that he sustains to this day. You may not be a believer, but if you hang out in the temples, you will see many who are. Monks take him daily meals; people talk to him all the time, addressing him by name. As for the pilgrimage route on Shikoku, that hikeable mandala, many people do it a few temples at a time, which is what I did, and vow to return next year to pick up where they left off. I made that vow, but years later my next year is still waiting to happen. Vows, like mandalas, have a certain creative flexibility. If desire is there, and your intentions are basically true, you can see in an image what you want and fulfill a vow, wherever you are. The Met is as good a place as any to begin. “Japanese Mandalas: Emanations and Avatars” remains through Nov. 29 at the Metropolitan Museum of Art; (212) 535-7710, metmuseum.org.